Get Ready Mailbag: What’s up with vector-borne diseases? Welcome to another installment of the Get Ready Mailbag, when we take time to answer questions sent our way by readers like you! Have a question you want answered? Send an email to getready@apha.org. I hear that vector-borne diseases are on the rise. What’s that about and what can I do about it? You heard right. The Centers for Disease Control and Prevention said this month that vector-borne diseases have increased. And they’ve increased a lot. Luckily, there are things you can do to protect yourself. But first, let’s explain what we’re talking about here. Vector-borne diseases are the diseases you get from bug bites. Most often, that means mosquitoes, ticks and fleas. They tend to get the disease from animals and then pass it on to humans when they bite. The new CDC study said illnesses from mosquito, tick and flea bites have tripled in the U.S. More than 640,000 cases were reported from 2004 through 2016. (That’s a lot of bug bites!) We’re talking diseases like Zika, West Nile virus, dengue, Lyme disease and Rocky Mountain spotted fever. As climate change is making the U.S. hotter, the bugs that spread these diseases are moving around to new, warmer locations in the US and infecting more people. So what can you do? The most important way to fight vector-borne diseases is to protect yourself. That means wearing insect repellent and long-sleeved shirts and pants. You should find and remove ticks daily from family and pets when they go outdoors. Avoid outdoor activities during peak mosquito hours from dusk until dawn. And install screens on the windows in your home and repair screens with rips or tears. 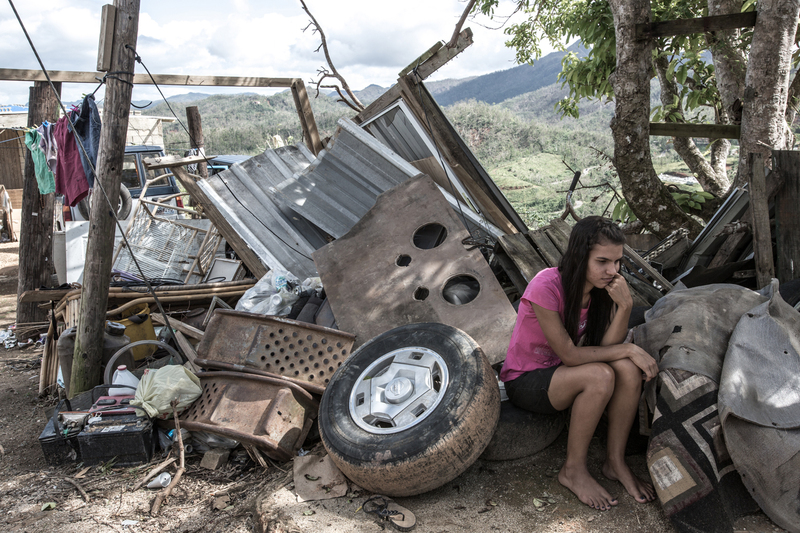 Do you remember Hurricanes Harvey, Irma and Maria? We sure do, and so do people in Texas, Puerto Rico and the U.S. Virgin Islands. Many of them are still recovering, in fact. The three storms were so destructive that the World Meteorological Organization has retired their names. Last year was one of the most active seasons for Atlantic hurricanes ever recorded. With 17 named storms and 10 hurricanes, 2017 was one for the record books. The National Oceanic and Atmospheric Association hasn’t released its 2018 hurricane season predictions yet, but a few other groups have. Colorado State University's Tropical Meteorology Project is predicting another above-average season, with 14 named storms. It’s not just the number of hurricanes we have to look out for, though. It’s also how severe they are. A study that just came out says climate change is heating up the oceans, which is making hurricanes worse. Waters in the U.S. Gulf were hotter last year than any time on record, which fueled Hurricane Harvey as it headed toward Texas, researchers say. “As climate change continues to heat the oceans, we can expect more supercharged storms like Harvey,” says Kevin Trenberth, a senior scientist at the National Center for Atmospheric Research and lead author of the study. With the Atlantic hurricane season starting June 1, now is the time to begin planning for your safety. Know where you’ll go if you’re told to evacuate and how you’ll get there — and never ignore orders to evacuate. Have your emergency supplies updated and ready to take with you. Make sure your family members know how to communicate and meet up. And don’t forget to make plans for your pets. Get more hurricane preparedness tips in our Get Ready fact sheet. During Hurricane Harvey last year, thousands of people were displaced from their homes and were forced to seek shelter. They also sought out food, with many of them turning to the Houston Food Bank, which provided 750,000 pounds of food and supplies a day. Food banks play an important role in community preparedness, because they are often where people turn to for assistance after a disaster or emergency. That’s why it’s important to support food banks year-round. This weekend, it will be a lot easier to do so, thanks to a national food drive that will be coming to your door. When your postal carriers drop by this Saturday, they will be ready to pick up more than just mail. 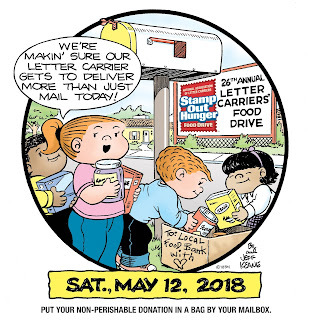 Saturday, May 12, is the national Stamp Out Hunger food drive, during which carriers pick up food donations that are set out next to U.S. mailboxes. Held annually since 1992, the Stamp Out Hunger food drive is the nation’s largest one-day food drive. The event is organized by the National Association of Letter Carriers with support from the U.S. Postal Service and other sponsors. To take part, just leave a sturdy bag containing non-perishable foods, such as canned vegetables, pasta, rice or cereal, next to your mailbox before your mail comes on Saturday. 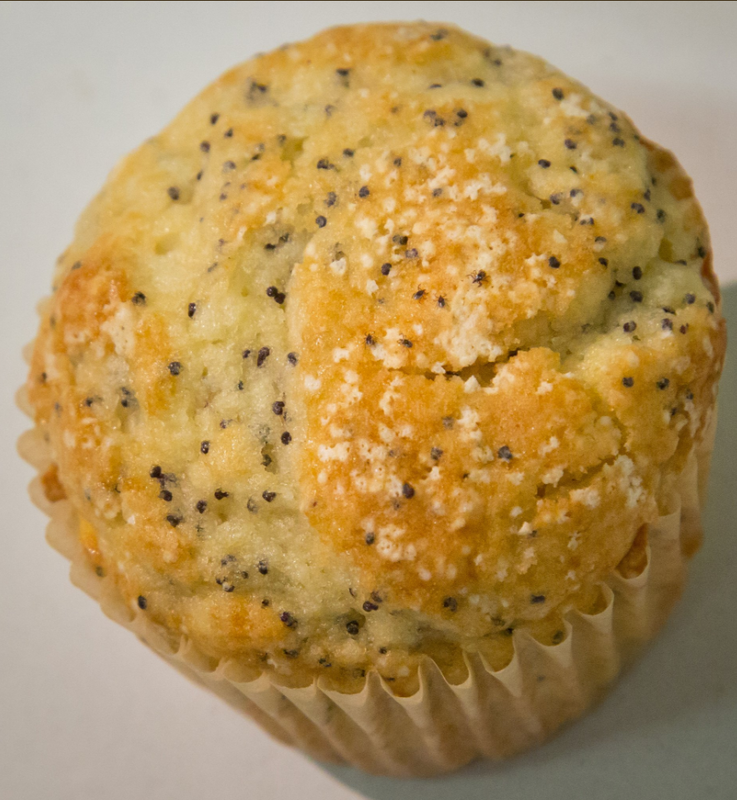 Food items should be in non-breakable containers, such as boxes and cans, and should not be expired. 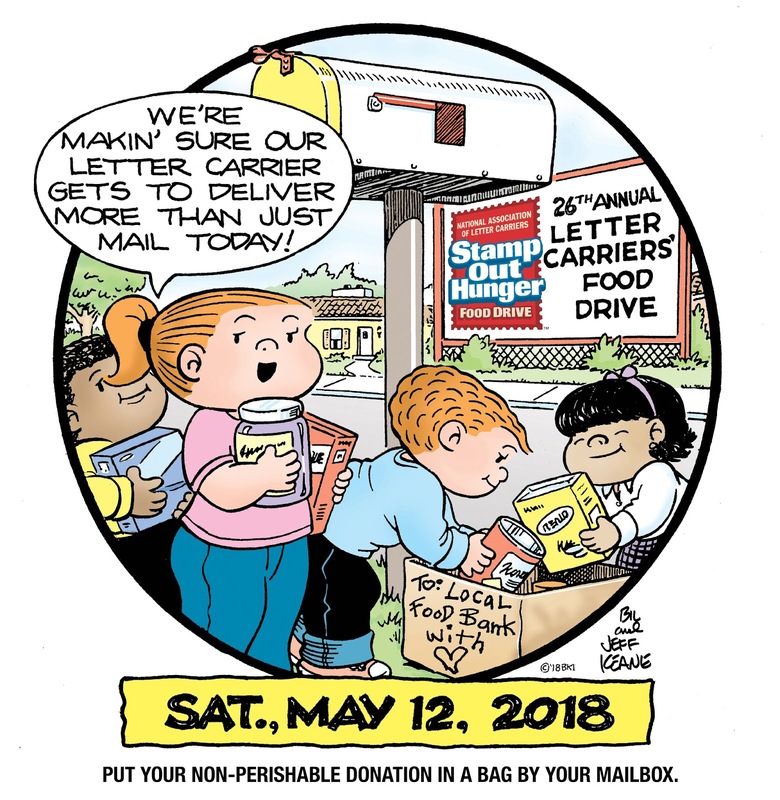 If you’re not sure whether your postal carrier will be taking part in the food drive Saturday, contact your local post office. Who’s ready for summer? Bright sunshine, blue skies and warm weather are a big “yes, please!” for most people. Frankly, we’re counting down the days to the summertime merry-go-round here at Get Ready. But with summer weather also comes summer storms. And summer storms can mean high winds, power outages, lightning, flooding and even water contamination. Way to rain on our summer parade, Mother Nature. 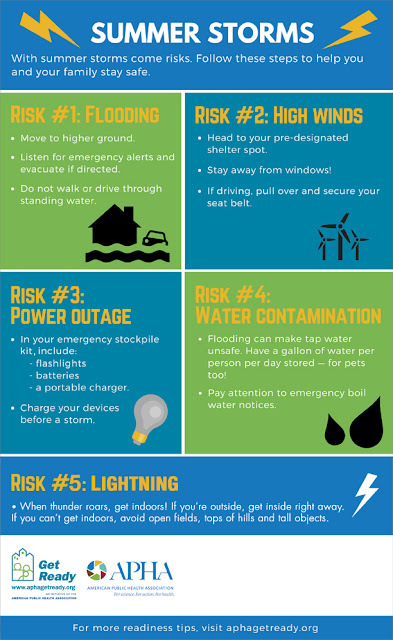 The good news is our new Get Ready infographic on summer storms can help you stay safe. It’s a quick and easy rundown of some of the risks you may face and ways to avoid them. Post the infographic on your website, share it on social media or print out a few copies. It’s great for hanging on break room bulletin boards or home refrigerators. There’s even a space for you to add your logo. In a jiff, you’ll be ready to get out there and enjoy that summer magic.